Last week one of my workmates sent me a message, telling me to visit my own site. Strange request, but I did, and when I did, it wasn't what I expected. Instead of the usual splash page, I got this. Barring the intentionally smudged-out parts (none of those things were accessible from the Internet, so I guess they won't be too happy with me sharing it), what you see is the big fat company site blocker in action, telling me I can't visit my own site. Luckily for me I can get around this particular case, but damn if this isn't annoying! And what's worse, the small print listed my site as Adult Content. Sure I might use a swear word here or there, but when one sees Adult Content, they think pr0n! Which my site doesn't have! 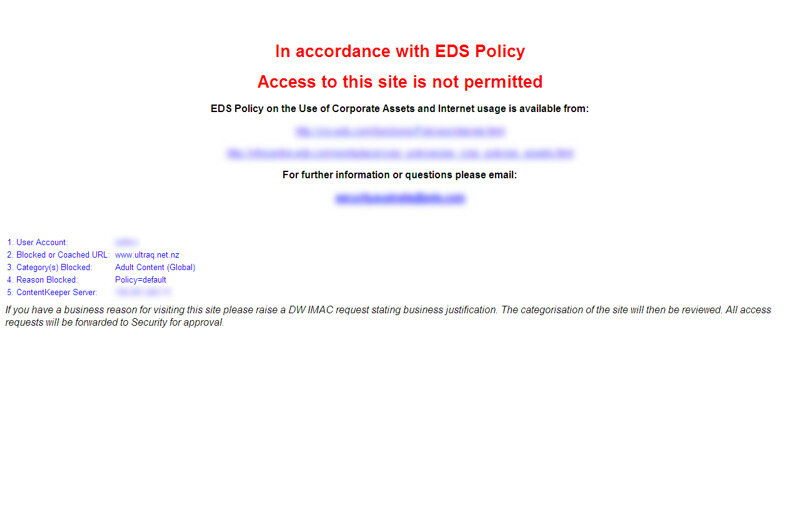 So when I get the time, I'm gonna see if I can't get my site unblocked. Failing that, maybe I should aim for a re-classification, like Drugs and Alcohol, or Cults (yes, they have a cults classification).